One of the leading lights of the new generation of top Hollywood composers, Newman matured in the 1990s to form his own recognisable music language that alternates between a more traditional orchestral sound and the unconventional, non-Western. Newman’s sound world goes beyond the world of the film soundtrack and extends into the minimalism of American composers Philip Glass and Steve Reich, as well as instrumental sonorities experimentation of Morton Feldman and Henry Cowell. Though he was nominated consecutively for 3 Academy Awards, Thomas Newman is yet to receive an Oscar. His acclaimed soundtracks form a long list and include the now cult score for American Beauty, as well as The Player, Erin Brockovich, The Shawshank Redemption, Road to Perdition, Wall-E, The Good German, Finding Nemo, The Green Mile and Revolutionary Road. 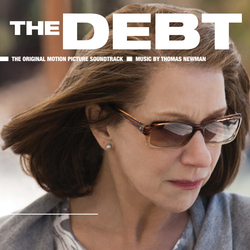 The Debt is a remake of an award-winning 2007 thriller by Israeli director Assaf Bernstein that tells a story about a Nazi war criminal who is pursued by a group of agents.